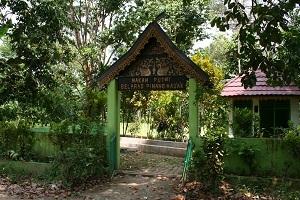 The Jambi Melayu Kingdom has several legends about how it originated. None of them can be authenticated with great historical accuracy. Many of these legends, still to this, day carry tremendous weight in the minds and beliefs of the Jambi populace. The most common legend of how Jambi originated is that a man from Turkey arrived in the eastern part of the Jambi Province. There he married a princess, or a descendant from one of the rulers of the Minangkabau / West Sumatran kingdom. 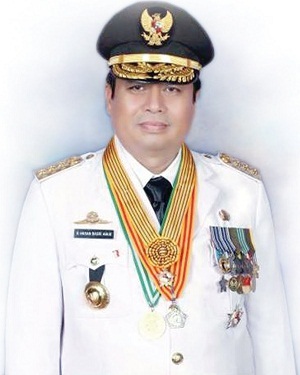 The man’s name was Ahmad Salim (other records say “Ahmad Barus,” or “Barus II”). After he married into the royal family, he received the title of “Datuk Paduko Berhalo.” (That is the local dialect spelling. In the Indonesian language it is spelled Datuk Paduka Berhala). Behala(o): Pulau Berhala (Statue Island) is the name of an island off the coast of Jambi where this man was said to have landed on his trip from the country of Turkey. It is also the location of where his grave is located. He was said to have destroyed the Hindu/Buddhist shrines and statues on Pulau Berhala, spurred on in his zeal to spread Islam. The princess’ name was: Putri Selaras Pinang Masak (1460). Her exact linage has been difficult to ascertain. The title of “sultan” began to be used in the early 1600’s when Islam entered and eclipsed the dominant Hindu / Buddhist religions. Raden Penulis or Sultan Seri Ingologo (1665-1690) There was war between Jambi and Johor (1667). VOC assisted Jambi in that war. There was a conflict between the VOC and the Sultan. The Sultan was exiled to Batavia (Jakarta). VOC installed a new Sultan. Sultan (Pangeran) Mahmud Syah (1696-1740). Another king began to reign from 1696 to 1721 in the city of Muara Tebo. His name was Suthan Sri Maharajo Batu. The crown prince, or prime minister was Raden Culip. Raden Danting (Sultan Muhammad Mahidin / Sultan Agung Sri Ingalogo Alamsyah—1812-1833) Husband of Putri Ayu. Sultan Muhammad Fachruddin (1833-1841). Pressured by the Dutch to sign a treaty. Sultan Abdul Rahman Nazaruddin (1841-1855 AD). Sultan Thaha Syaifuddin(1855….-1904). Opposed the Dutch till his death in 1904 at the village of Betung Bedarah. He was a “sultan in hiding” from 1858 till the day of his death, having been pursued by the Dutch. During that time the Dutch appointed other sultans. The overlapping of dates of his “sultanship” is for the purpose of historically showing Jambi’s opposition to the Dutch installment of the follow three sultans. Sultans that were considered “Shadow Sultans” (puppets), having been installed by the Dutch. (Many references say that Sultan Thaha was the last duly installed sultan, and the following three should not be honored with the historical title. After Indonesia’s independence, Indonesian regional leaders continued to carry the title of: “Residen.” Jambi was not yet officially a province at this time. The area now known as Jambi was part of a much larger region. 1957—Jambi officially became a province.